The School of Busking was founded in 2006. Our studios are in Cardiff UK. Our course and school has been featured all over the world. 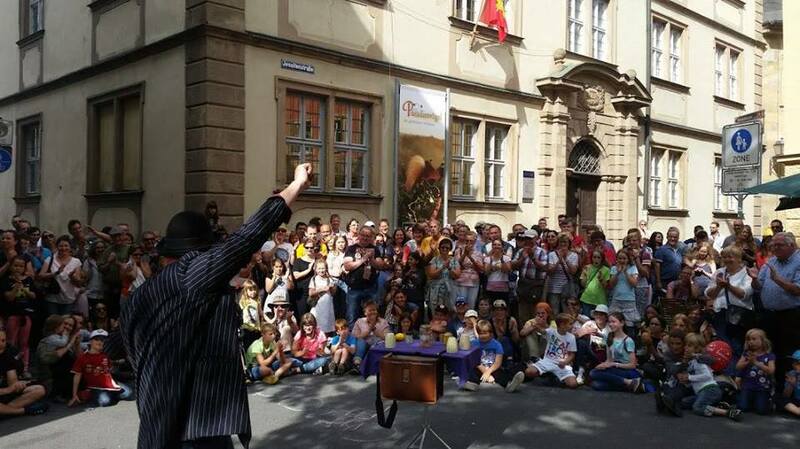 For eight years running The School of Busking also established a Focus on Street Magic with Jeff McBride at the Magic & Mystery School, Las Vegas. We have drawn together a fantastic team in Europe to help make this a unique, life changing learning experience! Without doubt the best money I have spent on furthering my skills and knowledge of magic and performance. I’ve been on this course 3 times and I highly recommend it! I get inspired each time I attend. A 3-day intensive training course has been running since 2006 – teaching the finer art of street theater and busking. The founder, trainer, and host Mario Morris will lead you through a captivating experience consisting of lectures, workshops and performing – both in front of your fellow students and on the streets. The course is limited to 10 students. The School of Busking – is designed to hand over the skills of a street performer. We provide a safe learning fun environment for variety performers from Street Theatre to Cabaret and Stage Acts. A place were you can grow and cultivate your own act and learn the art of street performing. Beginners, Intermediate or Advanced students of performing art, magicians, circus performers, street entertainers, sideshow performers and the bizarre and unusual. The list is up to you, Contact us if your not sure or if you have any questions. We draw from a wealth of experience of street theatre, cabaret and stage performances providing tips and first class insights, through theory – we even demonstrate the theory through interactive workshops so we can put into practice what we have been learning. Mario Morris Magician, storyteller, world-renowned outdoor, stage and theatre performer and comedy magician – in 2006 he founded the School of Busking in 2006 in the UK. He specialises in coaching, mentoring and empowering performers to perform. He Is a certified practitioner by Oxford Brookes Universty. He is a guest performer, teacher and coach of the McBride in Magic & Mystery School in Las Vegas. He is an expert coach and motivational speaker. He has performed at events across the world with his magic show. He has performed from the street to the stage and has taught many the world over. The School of Busking – a 3 day course that is designed to hand over the skills of a street performer. 11am to 5 pm – There will be a focus on the theory, tips and ideas. We look in depth at how do you attract a crowd and how to turn a crowd into an audience. How to keep an audience, entertain an audience and how do you get your audience to respond to you. These are just a handful of subjects we will cover on the day one. 10am to 5 pm – Mario will be running the is part of the day and the day will be filled with workshops and focusing on your show. On this day break your show down into 3 parts throughout the day. This is were we begin combining the theory together with your show. First role playing – attracting an audience – secondly keeping and entertaining your audience – thirdly getting your audience to respond. Then we tie it all together and you rehearse your show in front of the class,were last tips and ideas are shared. Saturday Evening – Magic time – share, swap and socialise. 9am to 5pm This our final day – but it is far from over! This is the day we hit the streets – students who choose to now have the chance to street perform. Mario Morris will be looking after the class while we are on the streets. He also takes detailed notes of your show. Performing on the street is not compulsory but highly recommended to put what has learned into practice. After the shows, we then head back to the School of Busking for feed back session. Feed back is never given on the street we always wait until we return. This has never failed to be an encouraging experience for all involved. Accommodation and food is the responsibility of the student during the course. We have secured fantastic shared accommodation in excellent holiday lets close by to the course. Excellent rates. Contact us for more details. We have teamed up with local performers who also have fabulous holiday homes just 20 minutes away from Cologne airport. We will be adding more details here with links and prices for this excellent, shared accommodation at great rates. All students are responsible for their own food and accommodation over the course weekend. Any outdoor performance is reliant on weather! Since 2006, the students have always been able to perform their shows on the streets. In the case of bad weather we do have an indoor alternative where all students will be able to perform their shows. “An incredible experience. As a teacher with more then 20 years in the classroom, I know the amount time and effort it took to pull this off and they did it in every way! Nothing was held back – all questions answered and all subjects covered! “After the first night of ‘theory’ my head was overflowing with all the information and ideas presented to us. On the Saturday we began to put the ideas of building a crowd, entertaining a crowd and passing the hat together into shows, under Mario’s guidance. On the Saturday I went from having no show at all to having a complete show (though it still needs ALOT of work).